Dima Mogilevsky was born in Kiev, Ukraine, 41 years ago. During his childhood, he learned to draw, and spent long hours at his parent’s work place – the theater. Backstage, he observed the actors and was amazed by their ability to create a whole world just by changing their facial expressions. Dima arrived in Israel as a teenager in high school, and had to spend most of his time studying. He served in the Engineering Corps during his mandatory military service, which left him little time to paint. After his discharge, he studied programming and was employed as a programmer by a high-tech company. In 2012, after a 16-year hiatus, Dima returned to the art world while working as a senior programmer at an Israeli high-tech company. One evening, when Dima told his clever son that he had drawn years before, his son suggested that he would endeavor to be more independent, thus enabling Dima to find time for drawing. Dima accepted the challenge and start to draw. 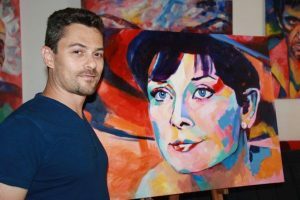 After displaying his natural talent, and fostered by his son’s support, Dima started drawing again; first by using a pencil, and then by using vibrant colors. Initially, his drawings were rather amateurish, but he was driven by a strong desire to give vent to his creativity. Although he worked long hours every day, he joined Dr. Anton Biedermann’s drawing class at the Visual Art Institute in Petah Tikva. After studying for a year, Dima began drawing mostly portraits of famous persons, which are easily recognizable. By using a new personal technique that combines visual accuracy and impressionism, Dima focuses on facial expressions that reveal the person’s internal world by using bright colors and the effects of light. This is reminiscent of the actor’s expressions he remembers from his childhood. In his drawings of famous people, Dima captures the movements and flow within the bounds of sharp colors. He enables viewers to discover hidden aspects of both themselves and the well-known personalities. Dima’s use of color in his drawings expresses the variability of an artist who has an unlimited potential of dreams, talent, and a rich internal world. Dima’s art fills one’s soul with an amazingly colored dance; it inspires and spurs the observer’s internal light.